Snapshot of Tonga – Tongan and English are the two official languages of the Kingdom of Tonga. Most of Tonga’s inhabitants live on the island Tongatapu. About 98% of Tonga’s population is Christian, with the largest denominations being the Free Wesleyans, The Church of Jesus Christ of Latter-day Saints, the Roman Catholic church, and the Free Church of Tonga. Much of modern Tongan culture is influenced by both Christianity and Polynesian traditions. Businesses and entertainment venues are closed on Sundays by law. Though Western-style jobs have grown more common, some people still make their livelihood from fishing and farming. Women hold a higher social status than men in traditional culture. Rank and status also play a large role in Tongan culture—people are born into their rank, and Tongan culture has a social hierarchy involving chiefs and commoners. The king and high chiefs (or nobles) have the highest rank and status. Landscape of Tonga. By Tauʻolunga (own work) [GFDL], via Wikimedia Commons. Traditional crafts include mat-weaving, including the ta’ovala, a traditional mat worn around the waist at formal occasions by both men and women. Tupenu, a skirt cloth, is worn in regular daily life. Wood carving and canoe building are also traditional crafts. Concerts called koniseti are sometimes performed in villages as fundraisers for local sports teams or church congregations. Rugby is the most popular sport in Tonga. Eating is a popular part of Tongan culture, and large bodies are traditionally revered. Meat dishes, such as corned beef, lamb, and chicken are quite popular. Pigs are traditionally cooked for special social occasions. Western influences have made food items such as bread and soda popular. Another Tongan dish is topai, a type of dough ball topped with a syrup made from coconut milk and sugar. Several tropical fruits are commonly eaten or used in other ways, such as to make the drink ‘otai, which is made using watermelons and coconut milk. 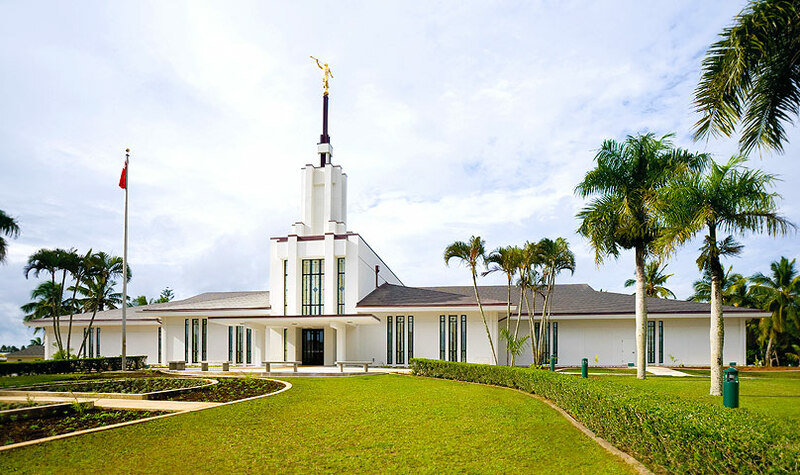 There are 60,680 members of The Church of Jesus Christ of Latter-day Saints in Tonga in 166 congregations—with one temple! Liahona High School in Tongatapu: In 1926, the Makeke school was established to help educate the people of Tonga. It later expanded into the Liahona High School. It has not only helped build the Church, but also it has helped in the progress of the nation as a whole. The most common crime in Tonga is petty theft, so be aware at all times of valuables you are carrying with you. Use common sense and be aware of odd behavior in another individual. Avoid untreated tap water and ice. Drink at least 3 liters of water per day to avoid heat exhaustion. Women in Tonga have a higher social status than men. Family members will greet one another with a “sniff-kiss.” This is when a person puts their nose next to someone’s face and breathes in deeply. In Tongan culture, to be large is beautiful. Tongan mourning ceremony. By Tauʻolunga [CC-BY-SA-2.5], via Wikimedia Commons. A child’s first birthday is an important milestone. The family celebrates by throwing a huge feast and exchanging koloa (textiles). Women make a type of cloth called tapa, or ngatu, out of mulberry tree bark. They pound the bark together, and then paint traditional geometric designs. Climate: Tonga's climate is tropical, enjoying both a dry and rainy season. The rainy season begins in December and ends in February. It is generally warm throughout the year, with a temperature rarely lower than 65 and usually never higher than 95 degrees. *What food did you eat a lot of? *What’s something special about the Tonga Nuku’alofa mission? *What advice would you give to a missionary headed to Tonga? *What are some of the local customs you observed? *What did you do on P-day? What was the main mode of transportation? *What do you wish you had known before serving? *What was surprising about the culture?